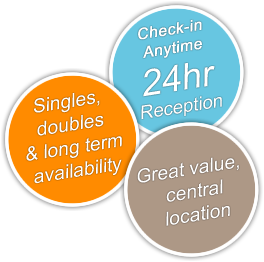 Prices include VAT, free continental breakfast provided every day between 8:00 am and 09:30 am. A security deposit of £20 or a form of photo ID is required for the room key. We accept Visa, MasterCard and Maestro credit and debit cards, as well as cash and Travellers Cheques. Cancellations require 48 hours advanced notice after which you will be charged. Dorm bed inclusive of breakfast and taxes. Only £85 ! For non EU guests requiring proof of booking for Visas, we can issue a personal confirmation letter, emailed as a secure PDF file. 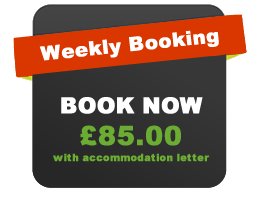 To receive an accommodation letter you need to make a weekly non-refundable booking for only £85.